Since the introduction of Strip Doors in the late 1960’s, not many new ideas have surfaced in the market with the exception of the revolutionary, patented, cost saving RIP-A-STRIP. This process allows dealers and distributors to extend their service and prices to the level of the manufacturer. 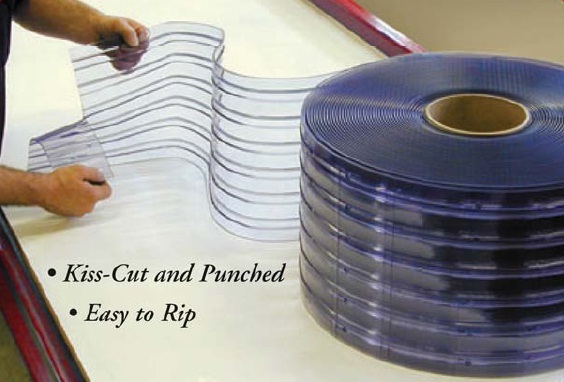 Distributors can stock products on the roll and easily rip off the number of required strips. 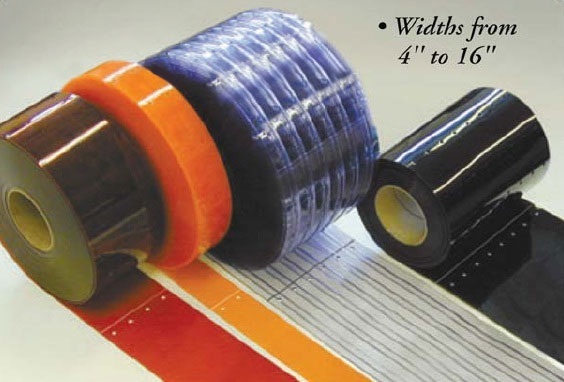 RIP-A-STRIP is a continuous roll of PVC strip material that is pre-cut and pre-punched to your specific length. The rolls are produced on State-of-the-Future machinery where the strips are pre-cut through 85% of the thickness (at your requested lengths up to 16’), mounting holes punched at one end on 2’’ centers, and rewound to the original shape. The process of pre-cutting is also referred as "kiss-cutting". Save money on the installation and maintenance of your PVC Strip Curtain with Rip-A-Strip, continuous rolls of flexible PVC strips, pre-cut and pre-punched for virtually instant installation, without tools. Indeed, the RIP-A-STRIP concept reduces the cost of replacement strips by as much as 35% while drastically reducing installation time. It is fast, convenient, easy to use and easy to store. RIP-A-STRIP is available in strip sizes from 4’’ wide to 16’’ wide, up to ¼’’ thick, and in lengths from 1 foot to 16 feet. RIP-A-STRIP is available in standard grade, low-temp, ribbed, anti-static, and all welding grades.